Precision Roofing & Building Maintenance - Painter/Decorator, Plumber, Roofer based in Stevenage, Hertfordshire. 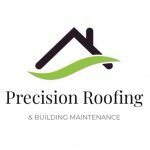 Welcome to Precision Roofing & Building Maintenance LTD.
With over twenty years industry experience, Andrew Bonney leads Precision in its operational direction, to achieve the aims of providing a high standard of roofing and building maintenance for both domestic and commercial clients alike. Our reputation speaks for itself. Precision Roofing & Building Maintenance strives to achieve the very greatest end result, in excellent time within the clearly set boundaries for cost. Excellent satisfaction ratings, professionalism, applicability and our approachable staff have enabled us to develop into a well respected body. So too have our relationships with clients and suppliers. These relationships have been cultivated over many years, based on mutual respect, integrity, fairness and reliability.